Bulk Email Solution is just what you want. And everything you need is here waiting for your exploration. Personalized HTML messages, newsletters, marketing emails, coupons, e-zines, promotions, etc., everything for your effective online campaigns is just right at your hand. Bulk Email Solution ensures you to design striking emails, heartwarming personalized messages quickly and easily with its powerful built-in HTML editor. ...... personalized messages quickly and easily with its powerful built-in HTML editor. 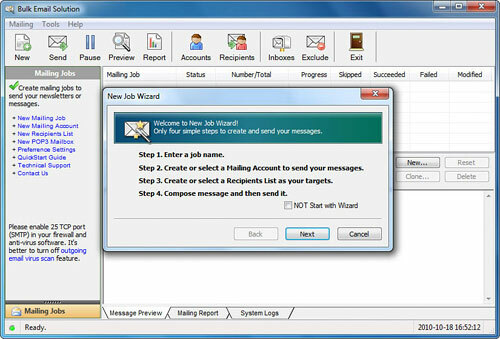 Create your email job, choose your recipient list and click the send button. Done! It is that simple for your marketing. With Bulk Email Solution, you can easily import unlimited recipient lists, add or delete addresses. The automatic unsubscribe option makes you stay compliant with CAN-SPAM law. Sending report will tell you everything essential about your emails and the results about which emails have been succeeded, skipped or failed. More add-ons make Bulk Email Solution offer the most convenient, efficient and economical service. Send newsletters and mass emails to your customers! 123 Bulk Email Direct Sender is a professional high speed bulk email sender. Email Component with S/MIME and SSL/TLS, with no STMP needed. Professional high speed bulk email sender program without using SMTP server. Powerful but easy to use Mass Emailer for bulk email operations. Qweas is providing links to Bulk Email Solution 2.2.0.2 as a courtesy, and makes no representations regarding Bulk Email Solution or any other applications or any information related thereto. Any questions, complaints or claims regarding this application Bulk Email Solution 2.2.0.2 must be directed to the appropriate software vendor. You may click the publisher link of Bulk Email Solution on the top of this page to get more details about the vendor.